For nearly three decades now, harried family man and insatiable glutton Homer Simpson has been mindlessly scarfing down pink frosted doughnuts both at home and at work on Fox’s deathless animated sitcom The Simpsons. 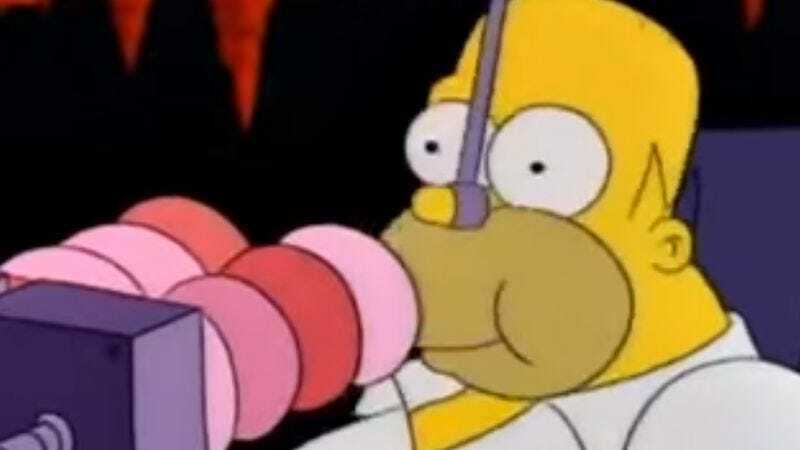 The fattening treat has become so closely associated with the series that pink doughnuts even became the central visual motif of the entire advertising campaign for 2007’s The Simpsons Movie. To put that into perspective, try to imagine a poster for a Teenage Mutant Ninja Turtles movie featuring only a pizza against a white background. As much pizza as the Turtles eat, that still wouldn’t work. And yet, The Simpsons can be distilled to an image of Homer’s hand reaching for a pink doughnut. That’s brand awareness. At her pop culture-based food blog, Pâté Smith, gourmand Christina Troitino now offers her very own glazed Simpsons doughnut recipe (or “D’Oh Nuts,” as she puts it) so that fans who wish to eat as Homer eats may do so in the privacy of their own homes, away from the cheap showiness of nature. A triple bypass may or may not be required afterward. The sweet, sweet details that Troitino provides would no doubt set Homer himself to drooling prolifically. “These donuts use a double rise method to make them nice and fluffy,” she writes, “and are then fried and glazed with a delicious raspberry frosting.” She also says that the donuts could theoretically be baked instead of fried, but it somehow seems like Simpsons sacrilege to go that route. Go fried or go home. Troitino also recommends that fans enjoy these donuts while watching one of those “Simpsonwave” videos that have caught the internet’s fancy of late. Until doughnuts start raining from the sky, this may be fans’ best option for tasting a beloved Springfield delicacy. Troitino estimates the total prep time at roughly three hours. But be forewarned: James Coco went mad in 15 minutes.